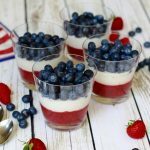 If you want to celebrate Independence Day with a guilt free dessert, this wonderful gluten-free, vegan parfait is just the treat for you. 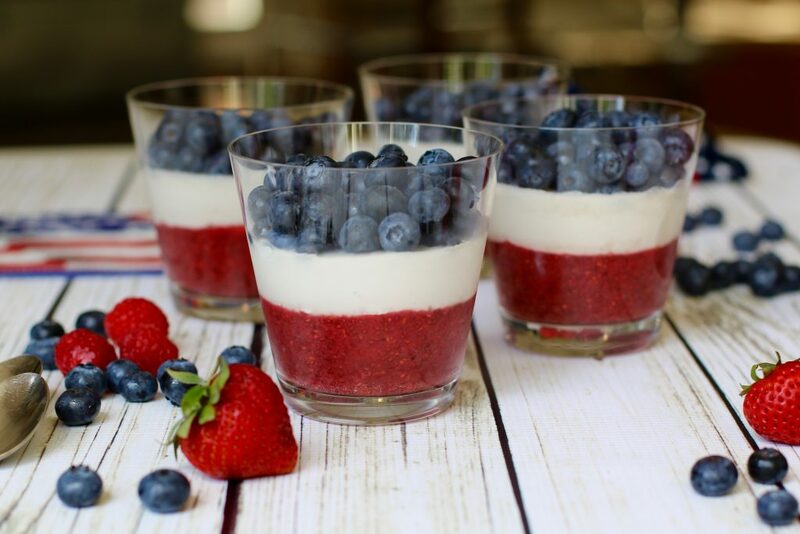 There is nothing like knowing that this red, white and blue combination not only tastes delicious but it is also a cancer fighting, brain boosting, metabolism enhancing delight! 4th of July, otherwise known as Independence Day, is a time to commemorating the adoption of the Declaration of Independence on July 4, 1776. We said bye bye to Mother England and hello to the birth of the United States of America. Fun Fact: Can you guess how many Presidents died on July 4th and what are their names? Flash forward 240 years, people are now enjoying fairs, fireworks, carnivals and ball games, but most importantly barbecues and picnics. 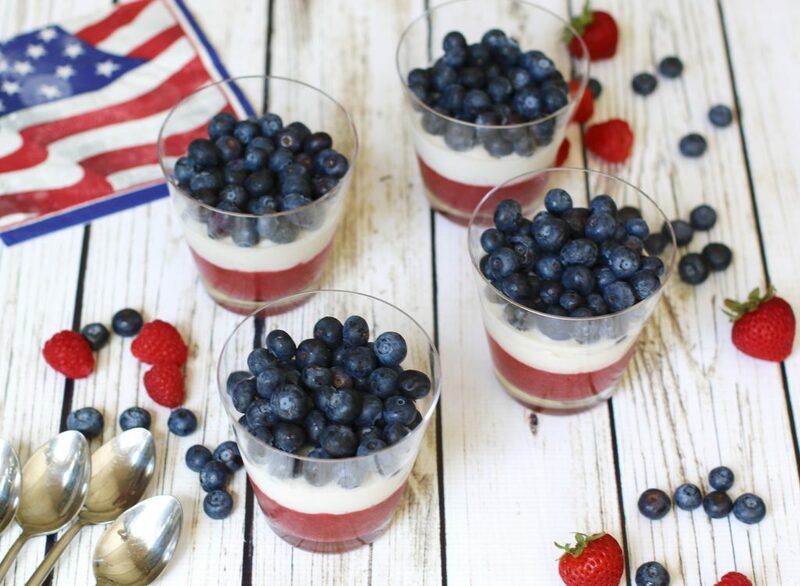 That is where my red, white, and blue parfait comes into the picture. I was not about to compromise my beliefs just for a quick fix. Please no artificial colors or sweeteners… you know, the stuff that makes things look pretty but are damaging to your overall health. Don’t get me wrong there is no harm in the occasional indulgence, but if I can transform a not so healthy dessert into “wholesome goodness”, I am all over that. When you think of parfait you think of layers of dairy, fruit, nuts and syrup. Dairy happens to be a highly inflammatory food and many people may lack the enzyme to digest cow’s milk. Although milk and dairy products are a part of the USDA Food Pyramid, experts at the Harvard School of Public Health do not believe this to be true. One of the most prominent critics is Walter Willett, MD, PhD, professor of epidemiology and head of the nutrition department at the Harvard School of Public Health. 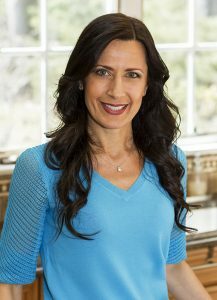 “One of the main arguments for USDA recommendations is that drinking milk or equivalent dairy products will reduce the risk of fractures. But in fact there’s very little evidence that milk consumption is associated with reduced fractures,” Willett tells WebMD. Many countries like Asia, where they do not consume much milk, have a low rate of fractures. Since my older son was 5 years old, I eliminated dairy from his diet due to sensitivity issues. I have blood work performed periodically and he is not deficient in any vitamins and nutrients. As a matter of fact he is a strong, healthy, very tall 10 year old boy and I make it a point to cook delicious and nutritious substitutes so he doesn’t feel excluded. 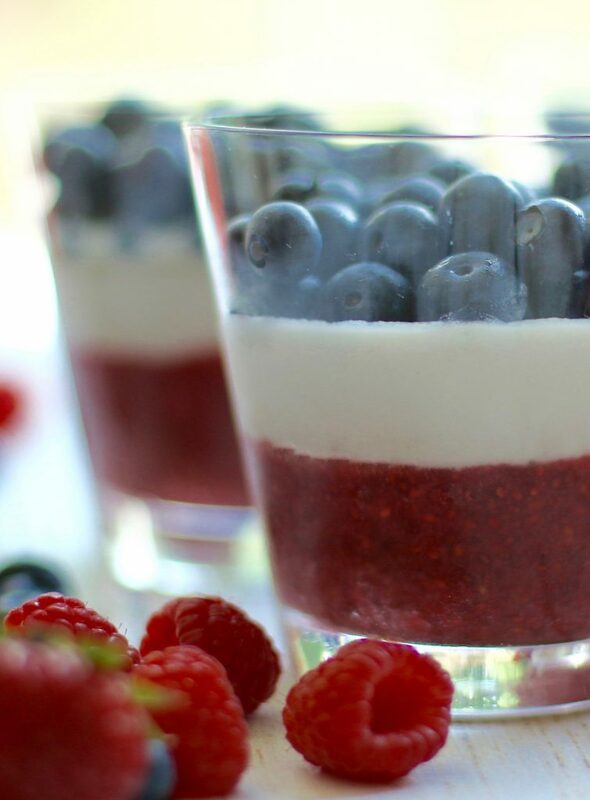 This colorful parfait is a perfect example of this healthy transformation process. Mother Earth has given us an abundance of beautiful and naturally colored foods that are packed with nutrients. So why do they continue to add artificial color enhancers is beyond me! 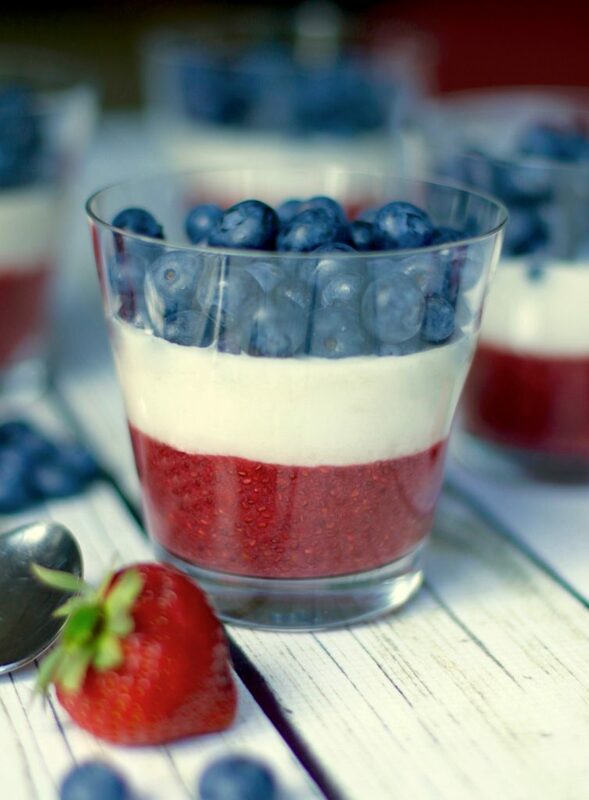 My patriotic parfait is a natural display of a red, white, and blue color combination sure to wow your guests. Below you will find the health benefits in each decadent layer. 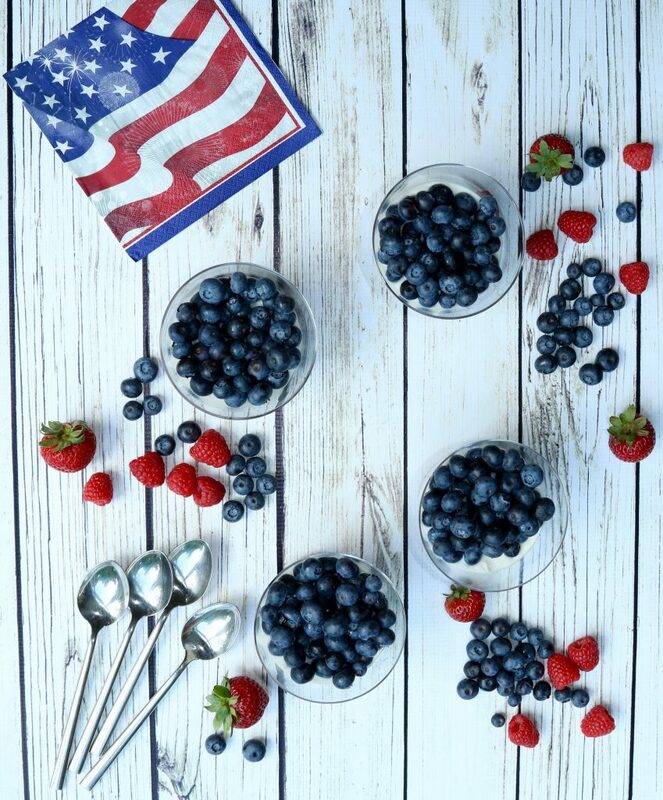 Strawberries, raspberries, and blueberries are high in antioxidants. Like most berries, antioxidants help fight aging and slow the growth of cancerous free radical molecules in your body. A study in Finland stated, when healthy women ate white bread with a strawberries puree the polyphenols in strawberries slowed the breakdown and absorption of carbohydrates which improved the glycemic response by 36 percent over those who just ate the bread alone. 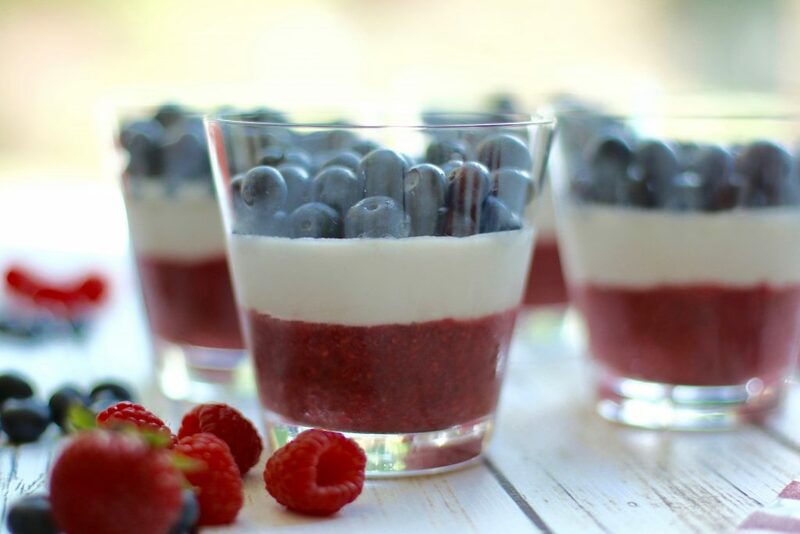 The addition of chia seeds not only gives this dessert a natural jelly like consistency, it is also rich in fiber, protein, vitamins, minerals, and brain-boosting omega-3 fatty acids. High in antioxidants, these little healers speed up skin’s repair systems and also aid in preventing more damage. Substituting coconut milk for dairy gives the dish a rich, creamy flavour without the unhealthy side effects attributed when consuming another animals milk. Coconut milk contains lauric acid, antimicrobial lipids and capric acid, which have antibacterial, antifungal and antiviral properties that can help fight against viruses and bacteria. Coconut milk also contains medium-chain saturated fatty acids that may also improve heart health. Not only beneficial internally, this creamy delight is a natural moisturizer that can aid in the repair of wrinkles and aging. New studies reveal that including healthy fats in your diet like the medium-chain triglycerides in coconut milk will help you feel fuller and you will eat less. Now that I have distracted you with all these nutritious facts, it is time to answer my fun fact! Answer: There were 3 presidents that died on July 4th: John Adams, Thomas Jefferson and James Monroe. How many of you got the answer correct? What do you usually do on the 4th of July? 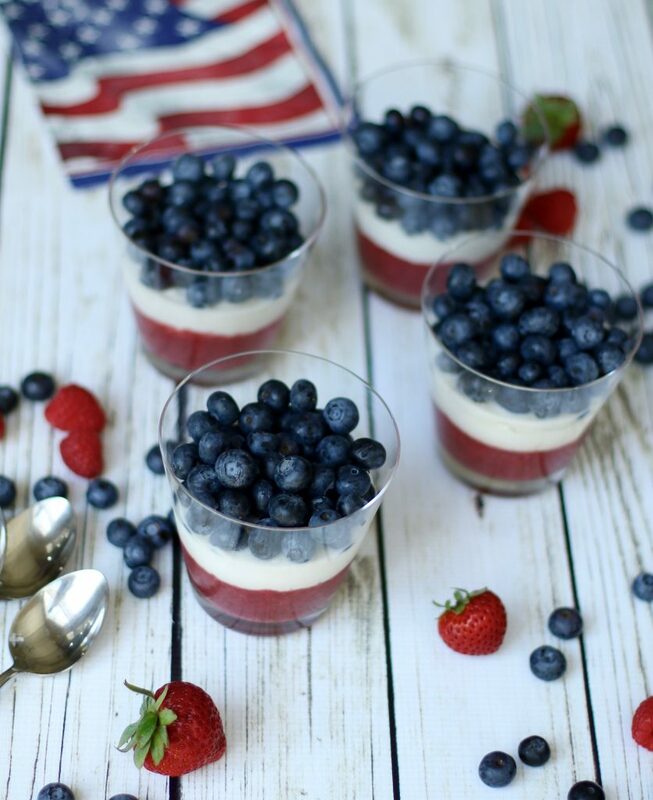 Independence Day is right around the corner and a patriotic parfait is the perfect recipe to celebrate this special time of the year. An excellent gluten-free, vegan, healthy option to indulge on any occasion. Combine strawberries and raspberries in a food processor and slowly add water until it is smooth. You may choose to use an unrefined sweetener if the berries are tart. I like to use maple syrup. Place the puree into serving dishes of your choice and refrigerator until it is thick about 4 hours. Place the coconut cream, maple syrup and vanilla into a chilled bowl and mix until it is smooth. Refrigerate until firm. 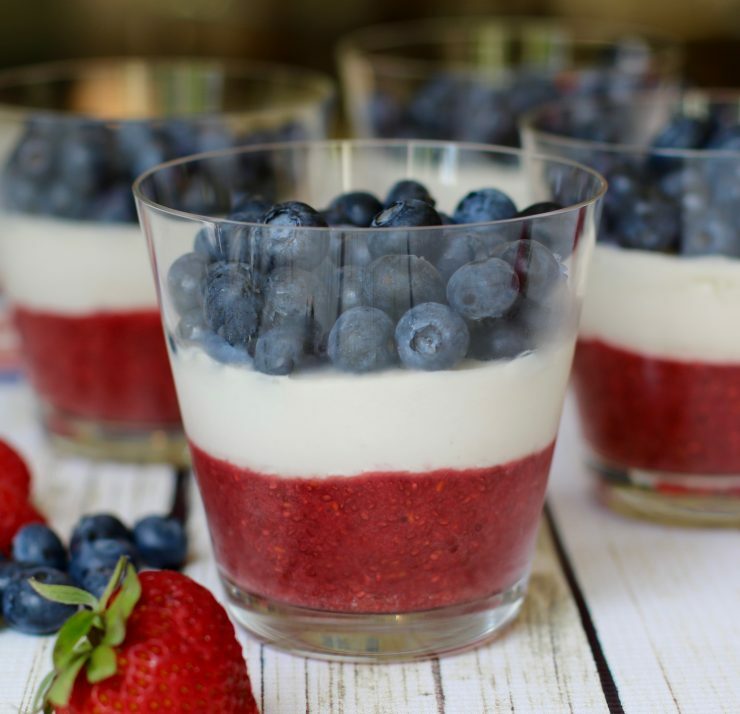 Once the berry chia seed puree and coconut cream is set, spoon the coconut cream over the berry chia puree and top with fresh blueberries. You may need to mix the coconut cream again if it is too thick. Serve immediately or refrigerate until you are ready to serve. A feast for the eyes and the palate. Nice and refreshing. Absolutely divine! You have a great talent!! This looks and sounds delicious!! This will be a treat. I am rushing to the store for the ingredients! !…I’m serious. Keep up the great recipes. Thank you so much! Excited to hear you will try it. A simple, healthy recipe and a great presentation! I will have to try this! What makes chia seeds thicken the berry and water mixture? Chia seeds absorb liquid giving it a jelly-like consistency. They also aid in digestion and hydration as well! What if the berry layer never gets set? Depending on the amount of liquid is in the berry layer. You many need to add more chia seeds. Let me know if that helps!! !